Hi friends! 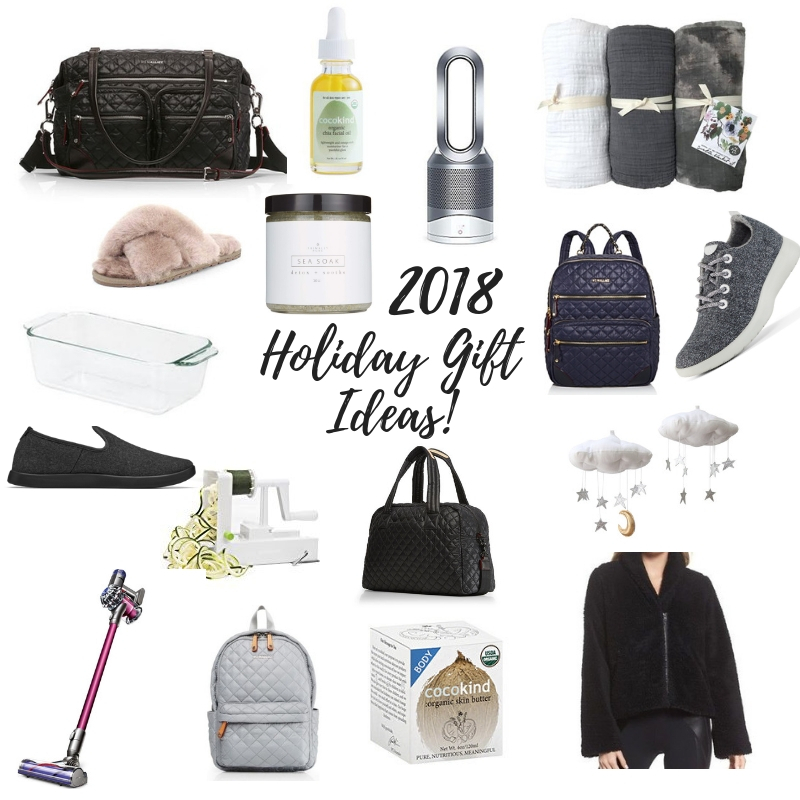 I am oh so excited (and somewhat proud of myself for getting my ISH together) because my 2018 Holiday Gift Guide is here and READY for you before Thanksgiving.. YAY! This guide has gifts for pretty much anyone in your life you may be shopping for this holiday season and I have included ideas in all different price ranges. It’s the season to spread the love to those in your life (and yes, that includes yourself) and I have put together a list of my favorite items that I personally own and have given to others for gifts in the past. You will notice these gift ideas are in different categories for who you are shopping but you can of course mix and match from each category as well. I tried to categorize them a bit to make the browsing a bit easier for you! The gifts listed for mama’s-to-be and easily be great for your “trendy friend” or mother-in-law or for yourself. Feel free to use this as a guide and customize to work for your shopping and browsing. And of course there is a section for what you buy YOU! As someone who does 99% of their shopping online, I also sign up for brand’s newsletters and follow them on Instagram this time of year so I don’t miss out on any deals! The stores linked below for the gifts are also customer-friendly when it comes to returns. This is something I always keep in mind. Of course we don’t give a gift with the intention it’ll be returned but you never know and I also always give a gift receipt. Belly oil + body butter ($12) my two most priced possessions right now during pregnancy. Ever since week 18 hit and my bump started growing, I apply the belly oil and body butter daily. It is key to help prevent stretch marks and it honestly just feels good to apply and give the beautiful bump some extra love. There isn’t a thing as too much body oil and butter when you are pregnant and even post-pregnancy I hear it is great to still apply as you breastfeed and your body adjusts. Baby Jives ($20+) – code RACHL for 15% – I stumbled on Baby Jives when we first found out we were expecting via Instagram. I have been swooning over everything they make and already stocked up on a few goods for when our little dude is here. I love their organically dyed swaddles, adorable mobiles (we have the clouds and moon!) and the blankets for those Insta-worthy photos. I’m going to be sharing more on what we have from Baby Jives once the babe is born but I did get a code (RACHL) for 15% all orders for you guys! Compression socks ($23) – if you have a friend who is pregnant and plans to travel or sits often for work, these compression socks are a life saver. I bought them before our trip to Europe and no, they aren’t the most fashionable but they are so needed. My ankles and feet have been getting really swollen from sitting (all the blood rushes to my feet!) and they are so helpful when flying. A practical and needed gift for anyone expecting. Letterboard ($39) – I have this on my list of things to order before the baby is born! Such a cute piece to have and I know you have seen these on Insta before. Even if babies aren’t on your radar, these letter boards are fun to mess around with and put funny or inspirational phrases on them. Ribbed dress ($49) – Ask Jord how many times I have worn this dress while pregnant.. I even have it in two colors (black and burnt orange). I wore it daily in California and in the summer when my jeans were getting way too snug and I wanted to be comfy. It is such an affordable dress and I love that you can wear it post pregnancy since it isn’t maternity. I will still be rocking this next summer post-bump. Fuzzy slippers ($58) I’m already on my second pair of these slippers. They are my favorite to keep on in the house. Since I work from home, I wear them basically all day and they also keep my feet warm in the winter but since they are open-toed they work in summer months too. I got these before I was pregnant but they are a great gift to get anyone and they wear very well. Cashmere pants ($198) – Besides that stretchy dress, these cashmere pants have been a staple in my everyday clothing. I dress them down as lounge wear at home and can dress them up with a nice blouse or sweater to go out for dinner or anything. I have the tan and black ones and need to practice serious self control not to get the gray! They’re amazing. Definitely a splurge item but again, these will fit post pregnancy too, which is important to me when investing in a pricier item. Dyson vacuum ($449) – I have been sharing my love for Dyson for a couple years with you guys now and I am still impressed daily over how insane this vacuum is. I was always so hesitant on getting it because of the price but we tested them out in the store a couple years back and they really really work. As someone who vacuums daily (crumbs galore over here), it makes the clean up less stressful. And when we have kids running around, I have a feeling the mess is just going to continue to grow! Cast iron skillet ($12) – The skillet that does it all. I fry my eggs in my cast iron skillet, make brownies, cookie cakes and even roast chickens in this thing. The cheapest and best investment ever. A must-have for anyone who likes to cook or bake in the kitchen. Pottery bowls, spoons + mugs ($18~) – No such thing as too much pottery. Except if you ask Jord, he would tell you I reached the maximum capacity over here. We will be storing bowls in our closet soon 😉 I am obsessed with these plates and these rose gold measuring spoons are gorgeous and great for photos or just to make baking even more fun for anyone. I also came across this bowl, which I ordered for one of my friend’s as a holiday gift. And still am contemplating ordering another for myself. Bread dish ($20) – The other staple for anyone who likes to bake. A glass bread dish is a game changer. It is so easy to bake banana breads with and you can pop it in the dishwasher after for cleaning. I have been using the same one for 5+ years and it’s still in great condition. And you guys see how many bread recipes happen over here. Inspiralizer ($39) – I have bought this gift for pretty much everyone I know. It is one of my most prized kitchen tools that is affordable and I use it weekly! Any of your friends or family members looking to eat healthier in the new year will thank you for this. Butcher Box subscription ($129~) – For any of your meat-loving friends or family members, Butcher Box is a lifesaver. They deliver quality, grass-fed meat to your home each month and it is cheaper than buying enough meat for the month at the grocery store. I know for some it is too much meat at once so I also recommend splitting it with a friend or family member if that is the case. You can pick what you’d like to include in the box. Some of my faves from there are the bacon, grass-fed burgers, whole chicken, pork sausage and the party wings! This link will get you FREE BACON for life and $15 off your order sooo that is pretty epic if you ask me. Berkey water filter ($292) – We splurged on the water filter when we moved to Hoboken and now if I drink water not from the Berkey, I spit it out. Do not want to sound like a snob but I am serious. It tastes like the cleanest water ever and it is well worth the investment. We have it in our kitchen and if you think about how much money you spent on water bottles or those poland spring jugs, this will last anyone years. It also helped us cut back on plastic since we got one. And the filtration system itself is a huge win. There is a reason I am so obsessed with the water I drink from it. Dyson air purifier ($499) – I have been gushing over our air purifiers now for well over a year. We have one in every single room (even in the baby room!) and I highly recommend this for anyone in your life. We have this one for the babe’s room and this one in our living room and bedroom. It is absolutely a splurge gift but it is something I cannot live without. I use it to keep our apartment air clean, I use it as a nose machine when we sleep and in the winter it’s our space heater (put it in the bathroom when you shower – game changer). More on my Dyson obsession here. Plant vases ($14-36) – Nowadays there is a 99% chance your bestie has a plant or at least has been eying some up at the local shop. Getting a fun vase is always a great gift and can be super affordable too. We have plants in every room (even the bathroom!). These face vases are so cute and I love this ceramic one too with the design/texture. This teardrop vase is perfect for eucalyptus and lavender. It doesn’t fit something with a larger stem! Facial roller ($28) – When Jord declined my ask to give me nightly face massages, I settled for a facial roller. I keep it in the fridge so it is cooling and supposedly it helps reduce inflammation and increase circulation in the face. I cannot attest to this but it feels so good when I roll it on my cheeks and forehead (especially after working!). Reusable cup ($38) – Straws are basically a dying bread as is the daily plastic cup use. Having a reusable cup makes someone actually want to use it instead of plastic. And now so many coffeeshops will fill up their coffee for you in your cup! Great to carry around. I also love this one. Palo santo kit ($38) – Every single night after dinner, I burn these to a) get rid of whatever smell I just made while cooking and b) to cleanse the air a bit before decompressing for the night. I’m addicted to smell of these! We keep them in the living room and bathroom and our bedroom. You can order a kit or just sticks which are super affordable ($6!). Allbirds ($95) – My Allbirds collection is getting somewhat insane at this point. But I kid you not when I say they are the most comfortable shoes in the world. I love walking around the city in my Wool Runner’s (I have them in a few different colors) and the Wool Lounger’s are a staple. They’re the best for travel, running errands, everything! Also they just launched high top Tree Topper’s that I ordered. Cannot wait to test those out! MZ Wallace Backpack ($225~) – 4 years ago I purchased my first MZ Wallace bag and haven’t looked back. I have successful started a collection in my closet (Jord is like please stop) but the number one bag I cannot live with out from them is the Small Metro Backpack. It is a must have and I use it daily to go into the city. It holds my snacks (obviously), water, sneakers, anything! I also use it for traveling and day trips. It is so durable in any weather and very easy to keep clean! You guys always see me posting stories with it on my back too and ask what it is. I also have this Small Crosby Backpack for something a little dressier! Spoiler alert: MZ backpacks are the shiz. Beard oil ($20) – code RACHL for 10% off – I have successful turned Jord, my brother and my dad over to the non-toxic skincare world. This beard oil is one of Jord’s favorites and a staple in his skincare routine. I am convinced he has more of a routine than I do 😉 This beard oil is great and a little goes a long way! The code RACHL will get you 10% off too. Monogram decanter ($42) – I solicited J’s advice for this section of the gift guide and this was the first thing he listed. He’s obsessed with our monogrammed decanter and glasses. He also got these for groomsmen as a gift too. They’re affordable, special and I’m pretty sure J feels cool af having his own decanter with initials on it. Suede moccasin slippers ($49) – I just bought these for Jord after our bathroom remodel. He had the same pair of slippers for 8+ years (no joke) and we found these at the mall. He has been raving about them and for the price, they are a steal. So warm and cozy and dudes deserve some extra coziness too, right?! Wool + leather tech gloves ($59) – Another must-have especially if you live in the city and are outside a lot. Any guy who is commuting around needs some warm gloves in the winter and ones they can still use their phone with. These are great and come in a few different colors too. Allbirds ($95) – My go-to gift for everyone is a fresh set of Allbirds. Jord now wears them and my Dad and I got my brother some for his birthday. They each have a different pair and are obsessed so safe to say all of the men’s options work perfectly. The new men’s Tree Toppers are insane (shhhh I got a pair for Jord) and you can’t go wrong with the Wool Loungers too. Leather boots ($248) – According to J this was one of his favorite gifts from me. He got them last year and he loves wearing them during the day, out for dinner, etc. They’re durable enough so he can walk around the city in the winter and they keep him warm. They’re a bit of a splurge but his are still in great condition and it’s already been a year of him wearing them non-stop. MZ Wallace Gym Bag ($275) – For the extra special guy in your life this bag is a must. I got it for Jordan last year and he uses it daily for the gym. It is almost like a mini duffel of sorts and fits his gym clothes, shoes, work clothes, etc. for his commute daily. You guys know I love MZ Wallace and this Travel Jimmy bag has been a success over here. Plus it is great to commute with too because it isn’t going to get ruin easily and when it rains, no one has to freak out about the bag getting ruined. I got J the black one! Candles ($14-24) – The amount of candles I buy for others and store in our apartment is scary. I’m a sucker for a good quality candle and light them every night. Of course you should know a bit about the person you are buying for and their scent preferences. I know to stay away from lavenders for my mom but my MIL on the other hand loves it. I recently stocked up on this dipped ceramic candle (the lavender spruce is my fave) and I love this mini metal candle (I have mountain sage). Solid finds and good prices for a smaller gift. Coasters ($16~) – My go-to gift always for anyone but these are definitely a hit with parents and in-law’s. Especially if they’re like my parents and constantly love to entertain. Plus my Mom loves a nice piece of decor that is also practical. These wood and marble ones are great and I also have gotten these coasters for a few friends as housewarming gifts. Cheese knives ($38) – I get you buy cheese knives to cut the cheese and blah blah but when they look like these, they also work as decor. Plus you can never have too many, so always a safe gift to give. Marble cutting board ($49) – Looking for something to go with the knives? This marble cutting board is gorgeous and great for entertaining. And just like the cheese knives, they add a little something extra to the spread. Comfy robe ($68~) – My mom has always been a robe queen. She is always wearing hers around the house, especially in the early mornings when she used to get up with us for school then at night after dinner. I myself have turned into a robe snob and have been searching all over for some new ones. I found this robe and it is so comfy and I love that it is longer too, which is great when you freeze all day like I do. I also love this tuxedo robe, which is a bit shorter and good for anyone who runs warm (like my mama!). Throw blanket ($138) – I love this throw blanket because it matches everything and we have it in our living room (along with 3 other cozy blankets!). It is so warm to use in the winter and just looks nice as an extra piece of something on the couch. Pajamas ($67) – Always a go-to gift for anyone. You can get a matching set of pajamas that look like loungewear and are so comfy at an affordable price. And we all know Dads aren’t going to buy themselves pajamas so don’t forget about him too! These ones are great and can be lounge pants and pajamas! Also loving these! Cocokind anything ($9~) – My favorite product cocokind has ever made is the facial cleansing oil. I use it for cleaning my body and face (call me crazy but it works). I also have very dry skin and in the winter especially this is amazing for me to use so my skin isn’t dried out from over washing. When I do exfoliate, it is only with sea moss because it is gentle and easy on the skin as is the chlorophyll mask. The macabeet stick I use for blush and a pinkish lip color. The matcha stick and turmeric sticks are two staples too, but honestly you cannot go wrong with any of these products. I have successful used them all! Primally Pure ($16~) – code RACHL for 10% all orders – my favorite deodorant is the blue tansy and Jord even uses it! He likes the lemongrass one. I carry this lip balm everywhere (but really it is in all my jackets and bags!). Their bath salts are amazing as well, I use them weekly and love the scents. The blue tansy oil I use for a DIY hair mask for my ends and on dry elbows, etc. in winter. Such a light and easy oil to apply. Woven journal ($28) – I’m the first to admit I’m the worst at journaling. But I do love hand-writing notes from work calls and my to-do list so I always have a journal around. I’m particular about the look of them because it makes the task 100x more fun (lame, yes but it’s true). Organic sheets ($58) – Treat yo self to some organic sheets. We started getting some a couple years ago but they’re not cheap. These are affordable and we have been loving them! At-home massage ($99~) – code RACHL for $20 off – I raved about this in the Mama-to-be section too but if you’re looking to pamper yourself in much needed self-care this season, a massage is a must. And one that is at-home just takes the cake. Winter boots ($230) – I finally bought a pair of winter boats that aren’t rain boots! I ordered these and they were on sale (code info on site). BAKING – hello DIY. You can bake something delicious for a friend or family member. A few of my go-to’s to make for others are Dark Chocolate Peanut Butter Pumpkin Candies, Crunchy Pumpkin Pie Granola, Blueberry Cinnamon Rolls, Vegan Chocolate Chunk Cookies but pretty much anything that is easy to transport! Home cooked dinner – have your family or friends over and make them a festive dinner for the holidays or as a nice gesture of gratitude for having them in your life. Happy holidays you guys! Sending you all the love and good vibes for a healthy holiday season.